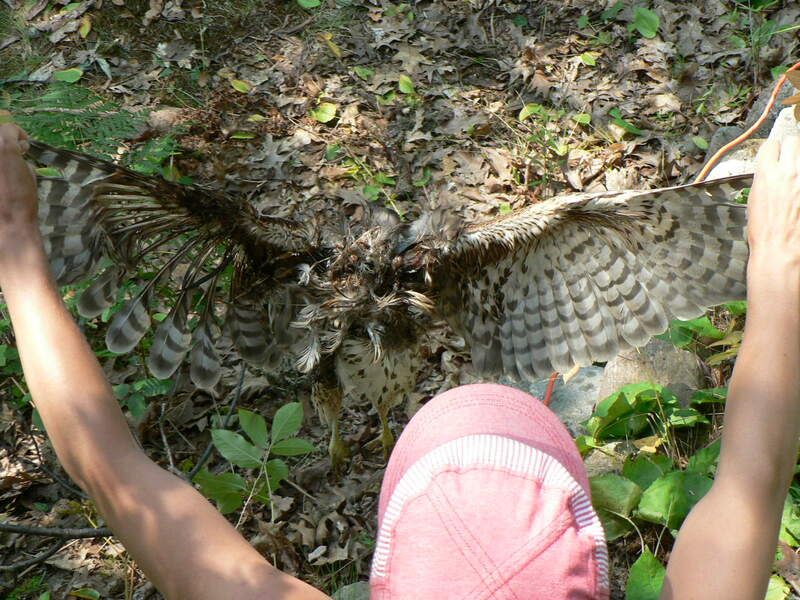 Finding a dead hawk, probably a young Red-shouldered. It’s partially decomposed, and its head was ripped off, probably by a Great Horned Owl. This article is part of a series, Towards an Anarchist Ecology. We are all connected to the land and, deep inside of us, that knowledge persists. It rises up in us when we’re out in the scrubby wild meadows that are always pushing back at the city’s edges, or it presses its way into our consciousness, interrupting our routines and reminding us what matters. We all get swept away sometimes for lots of different reasons. What’s important is to make sure to escape our daily lives, even if just for a half-running giddy trip to the pier on your night-shift lunch-break, to scream and laugh into the coming-winter winds. Most likely you will find wonderful surprises, like that wild strawberry and mugwort grow from the asphalt there. Or maybe just find time to stand outside the door, face warmed by the sun, observing a cheeky Bluejay. Such surprises open our hearts, eloquently reminding us of the amazing beauty and resiliency of the wild. Even when we return to work, the feeling lingers that we are always connected to that great web of life, that we are held by it and cared for. Re-enchantment is the word our collective thinks best describes this sort of feeling and action. It’s about curiosity, enthusiasm, play, and a desire to share it all with others. We strive to have our thoughts and actions grow from this re-enchantment, and we think it’s contagious. Because it wants to spread and be shared, re-enchantment is not a retreat. There is not enough wild space left for retreat to be an option, and attempts at personally escaping risk leave the needs of the land and of those most hurt by colonial society for last. We feel an urgency to fight back, to hold the hard truths in our hearts even as we pursue beauty and richness. Re-enchantment is a sometimes difficult and always ongoing process. We need to take time to heal and nourish the connection to the land that we are all born with. We include the prefix “re-” before “enchantment” to celebrate and emphasize this. Self-repression and alienation from the earth are actively beaten into us through forces like industrial education, mass media, and institutionalization. But we can break the spell by constantly fighting to remember, and to spread our enchantment like wildfire. For some folks, the weight of daily traumas and repression don’t leave room for much enchantment. Those hurt most by this culture of death are those who perpetrate destruction least and often have the least access to healing creeks and wise old trees. We’ve often come to places where the forest suddenly ends to make way for a giant mansion – it’s a visceral reminder that easy access to healthy wild spaces is directly related to class and social position. When access to wild space is reserved for the most privileged, what is good for the health of those spaces comes to be defined by the powerful. And when the powerful define what’s good for the land, then it becomes difficult to build a movement for the health of the land that also challenges power systems. Most modern conservation and environmental groups are tragically good examples of this: they embrace the logic of private property, policing, social control, and restricted access to protect pockets of wilderness in ways that are valued by elites. This leads to forests being seen as just another site of recreation and creates social and psychological barriers in addition to the material ones – “hiking” isn’t one of my hobbies, so why should I go to the forest? If we want to participate in resistance movements that are connected to the land on which they struggle, then unequal access to wildspaces can be a worthwhile challenge to take on. A few years ago, we went on a series of hikes with youth from a local neighbourhood who, when we first met them, thought that the only place to hangout was the mall. We offered to take them all to the movies if they went for a walk with us to a nearby waterfall. Running through the forest to the sound of rushing water, leaping between rocks, laughing as it began to snow – these experiences spoke for themselves. After that first walk, we didn’t need any more movie bribes. Through re-enchantment, some of the barriers to accessing wild space, not knowing about it or being afraid of it, melted away. Two examples of groups who support youth in re-enchanting in ways that inspire us are the Purple Thistle Youth Urban Agriculture Division in Vancouver, and Rooted in Rivers in Kitchener-Waterloo. These projects were initiated by politically engaged people who believe that deepening our connection to the land within our own lives or small social scenes is not enough. They seek to connect with those most impacted by environmental injustice. And these groups understand that relationships built from loving the land increases our capacity and desire to defend the health of the wild and of our communities – they see re-enchantment as part of broader social struggles. Waziyatawin offers a definition of cultural appropriation in Unsettling Ourselves that we take as a guiding principle for our work. We paraphrase it as: if someone is profiting from traditional Indigenous knowledge on traditional lands, while many of the Indigneous people whose knowledge and lands they are do not have access to them, and this person is not working to destroy those obstacles and contribute to decolonization, then that person is appropriating. They are a colonizing force. Unfortunately, mainstream conservation and naturalist groups, as well as many groups inspired by the Wilderness Awareness School, fall into this definition of appropriation. These groups, rather than building links in communities impacted by environmental injustice, focus their efforts on cultivating so-called “environmental leadership” among communities who already enjoy privileged access to wild spaces. And they also do work that disconnects our relationship to the land from an analysis of power or oppression. This is knowing the land without resistance, nature connection without decolonization, without struggle or solidarity. The strength of our relationships, both to each other and to the land, is our capacity for creation. We want to build relationships that are based on collectively breaking from the haze of city lights for a deep forest walk at night, remembering the ways that we can and will adjust, putting aside constricting safety concerns of city life, and embracing chaos and risk! We want to find that spirit of enchantment, share it with others, and work to let that spirit fill our lives and communities.